“Do you love me?” [the people: “Yes!”] Thank you, but I was reading the word of Jesus! Said the Lord: “Do you love me?… Tend my sheep” (Jn 21:15-17). Jesus’ words to Peter in today’s Gospel are the first words I speak to you, dear brother bishops and priests, men and women religious, and young seminarians. These words remind us of something essential. All pastoral ministry is born of love. All pastoral ministry is born of love! All consecrated life is a sign of Christ’s reconciling love. Like Saint Therese, in the variety of our vocations, each of us is called, in some way, to be love in the heart of the Church. To be an ambassador for Christ means above all to invite everyone to a renewed personal encounter with the Lord Jesus (Evangelii Gaudium, 3). Our personal encounter with Him. 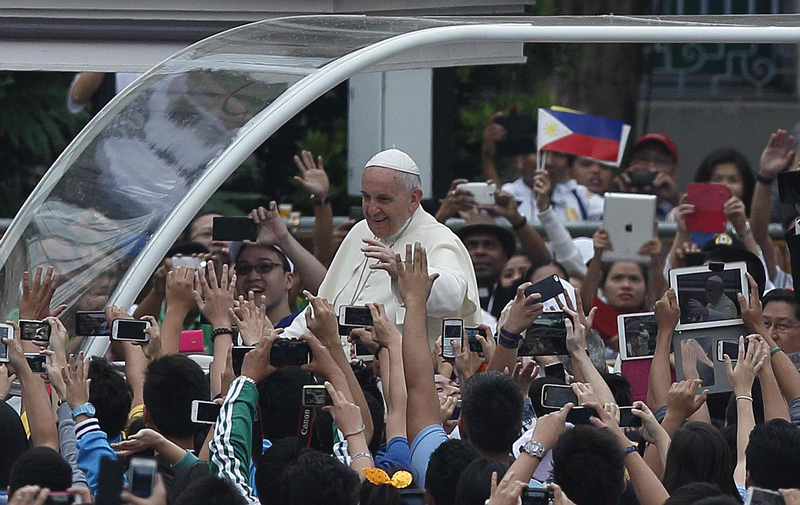 This invitation must be at the core of your commemoration of the evangelization of the Philippines. But the Gospel is also a summons to conversion, to an examination of our consciences, as individuals and as a people. 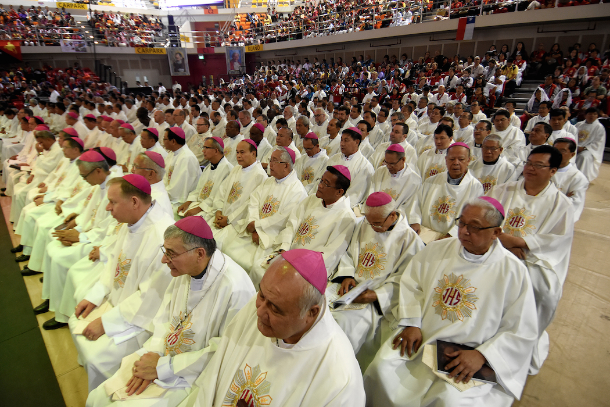 As the Bishops of the Philippines have rightly taught, the Church in the Philippines is called to acknowledge and combat the causes of the deeply rooted inequality and injustice which mar the face of Filipino society, plainly contradicting the teaching of Christ. The Gospel calls individual Christians to live lives of honesty, integrity and concern for the common good. 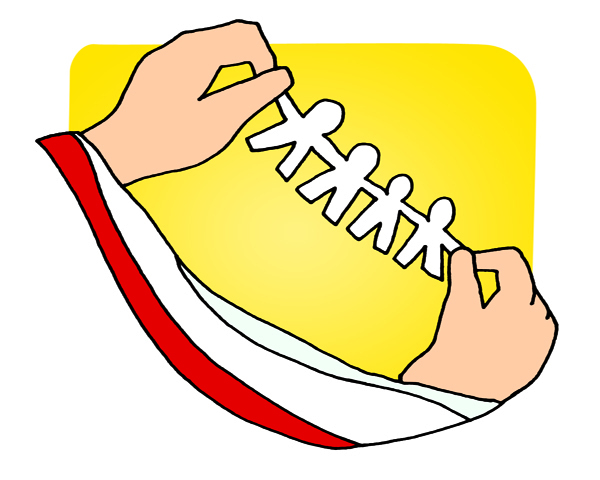 But it also calls Christian communities to create “circles of integrity”, networks of solidarity which can expand to embrace and transform society by their prophetic witness. The poor. The poor are at the center of the Gospel, are at heart of the Gospel, if we take away the poor from the Gospel we can’t understand the whole message of Jesus Christ. As ambassadors for Christ, we, bishops, priests and religious, ought to be the first to welcome his reconciling grace into our hearts. Saint Paul makes clear what this means. It means rejecting worldly perspectives and seeing all things anew in the light of Christ. It means being the first to examine our consciences, to acknowledge our failings and sins, and to embrace the path of constant conversion, every day conversion. How can we proclaim the newness and liberating power of the Cross to others, if we ourselves refuse to allow the word of God to shake our complacency, our fear of change, our petty compromises with the ways of this world, our “spiritual worldliness” (cf. Evangelii Gaudium, 93)? For us priests and consecrated persons, conversion to the newness of the Gospel entails a daily encounter with the Lord in prayer. The saints teach us that this is the source of all apostolic zeal! For religious, living the newness of the Gospel also means finding ever anew in community life and community apostolates the incentive for an ever closer union with the Lord in perfect charity. For all of us, it means living lives that reflect the poverty of Christ, whose entire life was focused on doing the will of the Father and serving others. The great danger to this, of course, is a certain materialism which can creep into our lives and compromise the witness we offer. Only by becoming poor ourselves, by becoming poor ourselves, by stripping away our complacency, will we be able to identify with the least of our brothers and sisters. 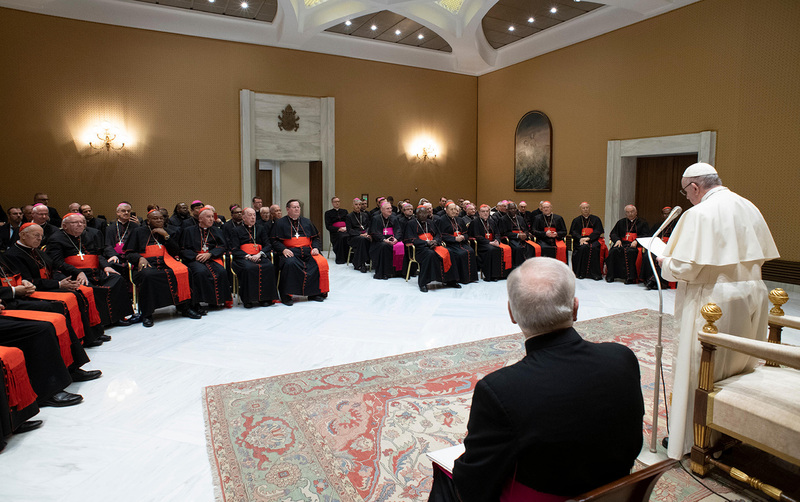 We will see things in a new light and thus respond with honesty and integrity to the challenge of proclaiming the radicalism of the Gospel in a society which has grown comfortable with social exclusion, polarization and scandalous inequality. 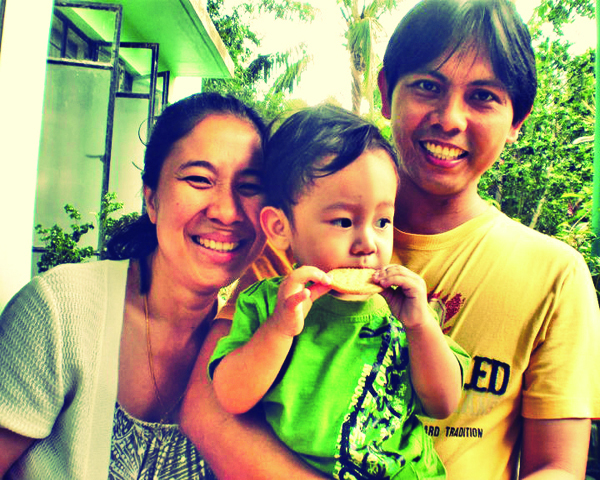 Filipino culture has, in fact, been shaped by the imagination of faith. Filipinos everywhere are known for their love of God, their fervent piety and their warm devotion to Our Lady and her rosary; their love of God, their fervent piety and their warm devotion to Our Lady and her rosary! This great heritage contains a powerful missionary potential. It is the way in which your people has inculturated the Gospel and continues to embrace its message (cf. Evangelii Gaudium, 122). In your efforts to prepare for the fifth centenary, build on this solid foundation. Christ died for all so that, having died in him, we might live no longer for ourselves but for him (cf. 2 Cor 5:15). Dear brother bishops, priests and religious: I ask Mary, Mother of the Church, to obtain for all of you an outpouring of zeal, so that you may spend yourselves in selfless service to our brothers and sisters. In this way, may the reconciling love of Christ penetrate ever more fully into the fabric of Filipino society and, through you, to the farthest reaches of the world. Amen.